The Julien Levy Gallery - only one of a few art galleries in Manhattan during its time - was a major destination throughout the 1930s and 40s for popular Surrealist art, photography and experimental film. Such artists who enjoyed solo exhibitions at the Levy included Giacometti, Tanning, Ernst, Magritte, Kahlo, Ray, Cornell, and probably most prominent of all, Arshile Gorky. Many of the 20th century's most revered works of Modern art passed through the Julien Levy Gallery doors at one time or another, making the gallery a fundamental resource for those artists who went on to define Abstract Expressionism. Julien Levy (1906-1981) began his foray into the avant-garde arts during his years as a student at Harvard. Among the impressive list of his classmates from the mid-1920s include Alfred H. Barr, Jr., James Thrall Soby and Philip Johnson. 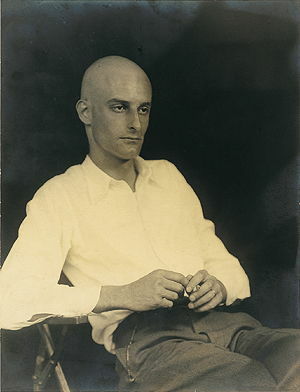 As part of this Harvard group, Levy became an avid art promoter and collector, and expressed a particular affinity for film and photography. Levy also possessed a deep affection for European Surrealism; a passion that would have a profound impact on the artists he represented in future years. Eugene Atget died the same year Levy arrived in Paris, and with help from Abbott, Levy was able to purchase the entire catalog of Atget's photography, which included 2000 prints and 10,000 glass-plate negatives. Like many American artists and dealers who were born around the turn of the 20th century, Levy was deeply fascinated with 19th-century Parisian art and culture, and preserving Atget's catalog was a way for Levy to preserve a photographic record of Paris from the past century. After three years in Paris, Levy returned to New York and made the decision to become an art dealer. Together he and Abbott put together a show of Atget's photography at the Weyhe Gallery, and soon after Levy attempted to sell the entire catalog to MoMA. Both the Weyhe show and his offer to MoMA were met with lukewarm responses. Remarkably enough, nearly 40 years after MoMA's Acquisitions Committee refused Levy's offer of the Atget photography catalog, they finally agreed to purchase the collection in 1969. This seemingly revelatory gesture by MoMA indicates precisely how far ahead of his time Julien Levy was in identifying significant artwork. In November of 1931 Levy opened his new gallery in midtown Manhattan with a photography exhibition that included works by his friend and mentor, Alfred Stieglitz. Quickly discovering that photography was hard to sell, Levy shifted his gallery's focus to Surrealism and to showing the work of artists like Dalí, Ernst, Ray and Cornell. As Abstract Expressionism was beginning to flourish in New York, Levy's gallery was a haven for other styles of art that heavily influenced the Abstract Expressionist artists. Levy's true passions were photography first, with both Surrealism and experimental film following closely behind. On constant view at the gallery were paintings by Gorky, Ernst, Picasso, Kahlo, Tanning, Matisse and Magritte, as well as collages and sculpture by Giacometti, Cornell and Noguchi. The artists, scholars and critics who eventually defined Abstract Expressionism in the 1950s spent much of their time at the Levy Gallery, which many viewed as a brief escape to a small piece of pre-1940 Paris, right in the heart of Manhattan. Pablo Picasso, Max Ernst, Man Ray, Salvador Dalí, Joseph Cornell, Marcel Duchamp and others. Once Levy decided to shift the gallery focus from photography, he launched the first of several group exhibitions featuring the Surrealists. This exhibition's key attraction was Dalí's The Persistence of Memory. Also on display were notable Surrealist pieces acquired by Levy during his years in Paris. Reportedly, It was at the Surrealism Paintings, Drawings and Photographs exhibition that Arshile Gorky saw something that fundamentally changed the way he made art for the remainder of his career. Interestingly, a similar incident occurred at the Julien Levy the previous year, when a young Joseph Cornell visited the gallery. After viewing a collection of collages by Max Ernst, Cornell was struck with an epiphany and immediately went home to construct a series of his own collages. Some of those very works were later featured in the Surrealism Paintings.. exhibition. As prolific a painter as he was, it's surprising that 1945 was Gorky's very first solo exhibition. It was not well received by the critics and only two works were purchased: The Water of the Flowery Mill (1944) and the far-less known They Will Take My Island (1945). Clement Greenberg wrote in The Nation, "Gorky has at last taken the easy way out - corrupted perhaps by the worldly success of the Surrealists." Following the show, Gorky's wife Agnes wrote to their friend and fellow artist Jeanne Reynal, "Don't for one minute think the critics didn't trouble Gorky." From the show it was readily apparent that Gorky had aligned himself with the Surrealists, alienating many artists and critics who had all but abandoned Surrealism and were turning to new modes of abstraction. Nonetheless, André Breton noted in an essay for the exhibition catalog, "..of all the Surrealist artists, [Gorky is] the only one who maintains direct contact with nature - sits down to paint before her [nature] to reveal the very rhythm of life."